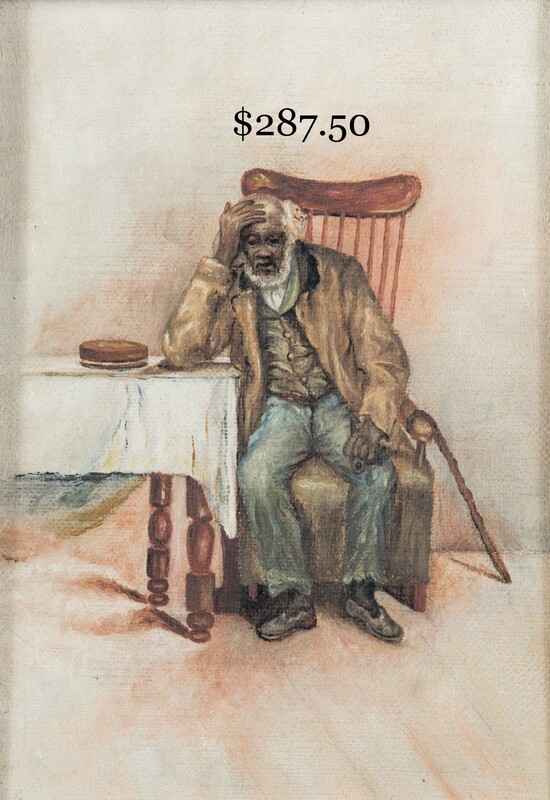 Saturday June 22, 2013 at 10:00 a.m.
Previews Friday, June 21st from 2:00 to 6:00 P.M. 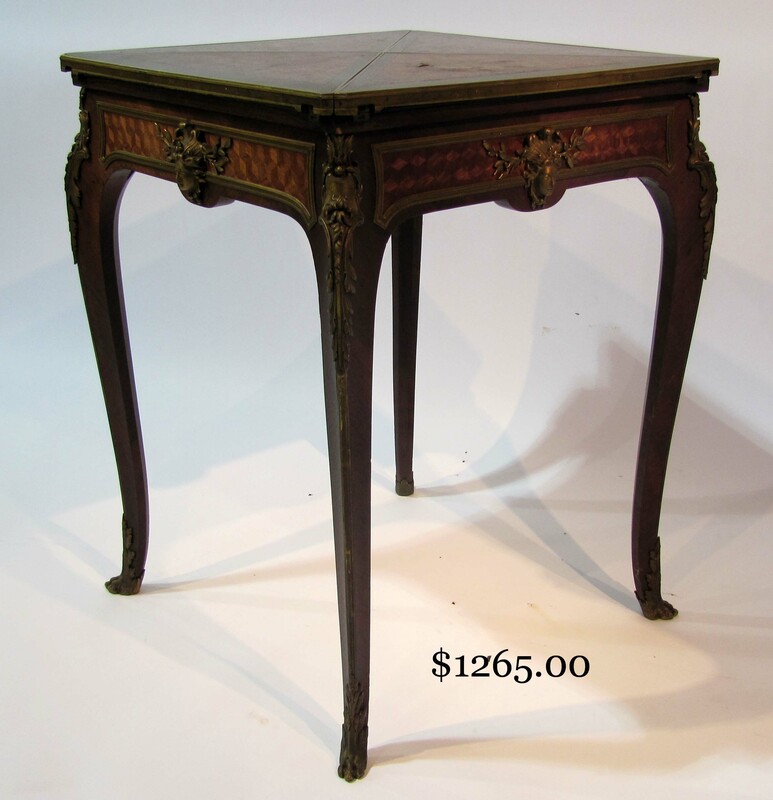 EARLIER FURNITURE: Fine early old red beaded leg tea table with 32 X 24 in. curly maple top. 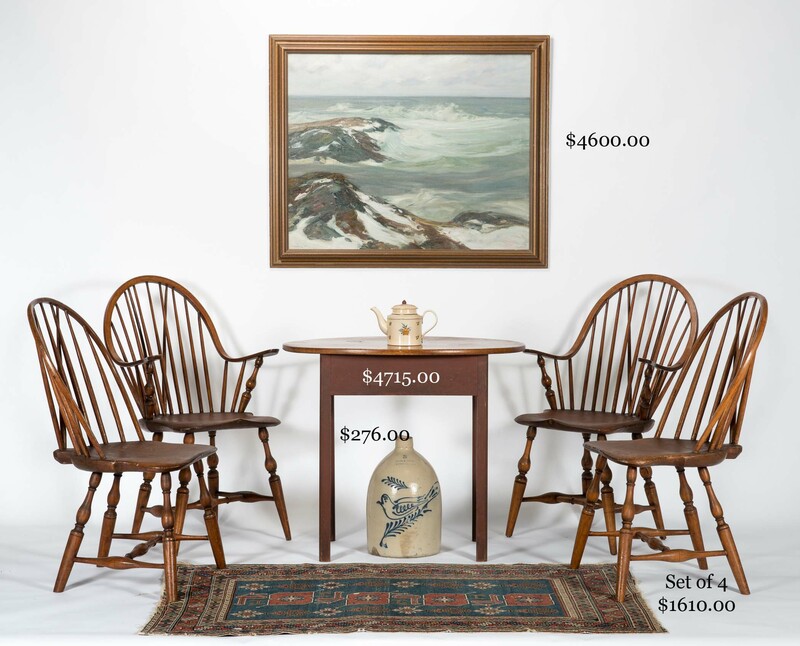 Four Windsor brace-back chairs, two with continuous arms and two side chairs. Seven spindle Windsor bow-back side chair. 42 in. cherry chest on turned legs having the 1820 signed and dated mark of John Carlile, Providence. 37 in. mahogany bowfront four drawer chest on turned legs below reeded columns and cookie corners. 40 in. bowfront mahogany chest on French feet. 30 in. 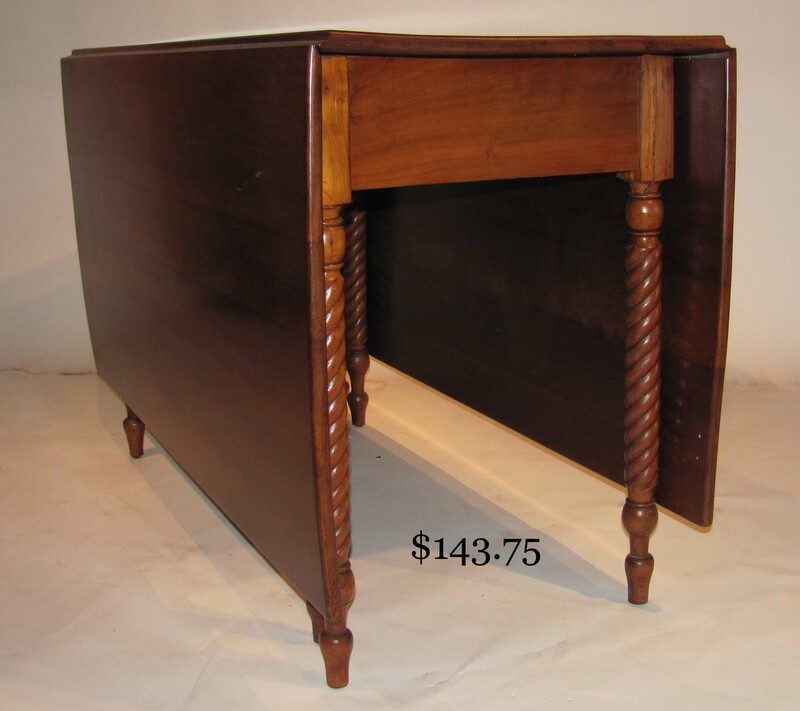 fluted leg, stretcher-base, one drawer mahogany drop leaf table with shaped skirt. 48 X 20 in. cherry drop leaf table on rope-turned legs, the leaves measuring 24 in. 46 in. maple drop leaf table on turned legs. 98 in. inlaid tall case clock with scrolled bonnet. 82 in. 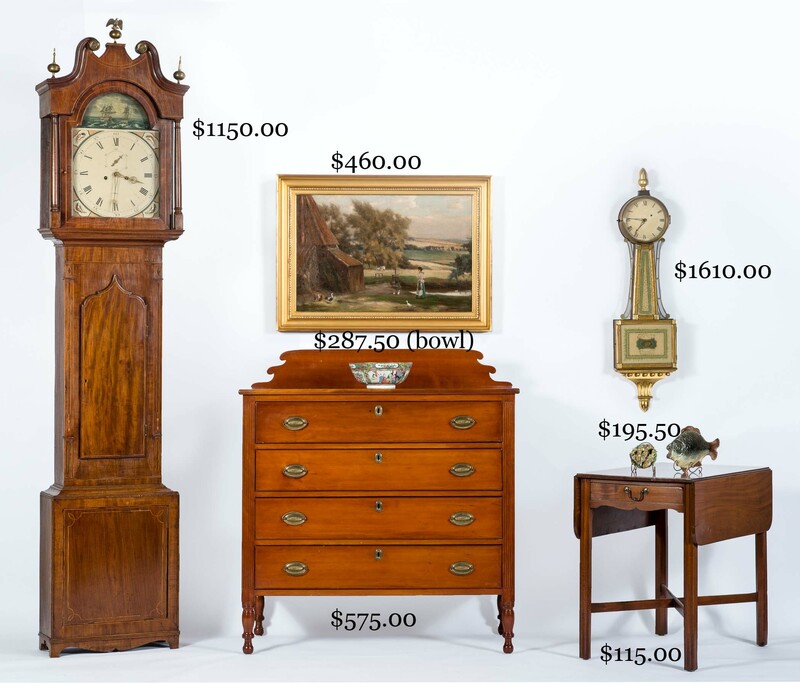 R. Whiting tall case clock. 76 X 41 in. 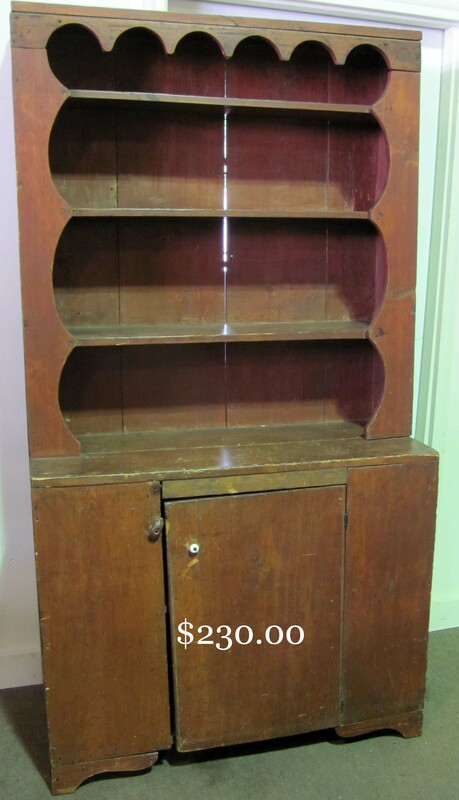 stepback pine cupboard with three shelf open top. 42 in. two door pine storage cupboard. 28 X 18 ½ in. old grey one drawer cupboard on shaped base. 30 X 15 in. sponge-grained storage box. 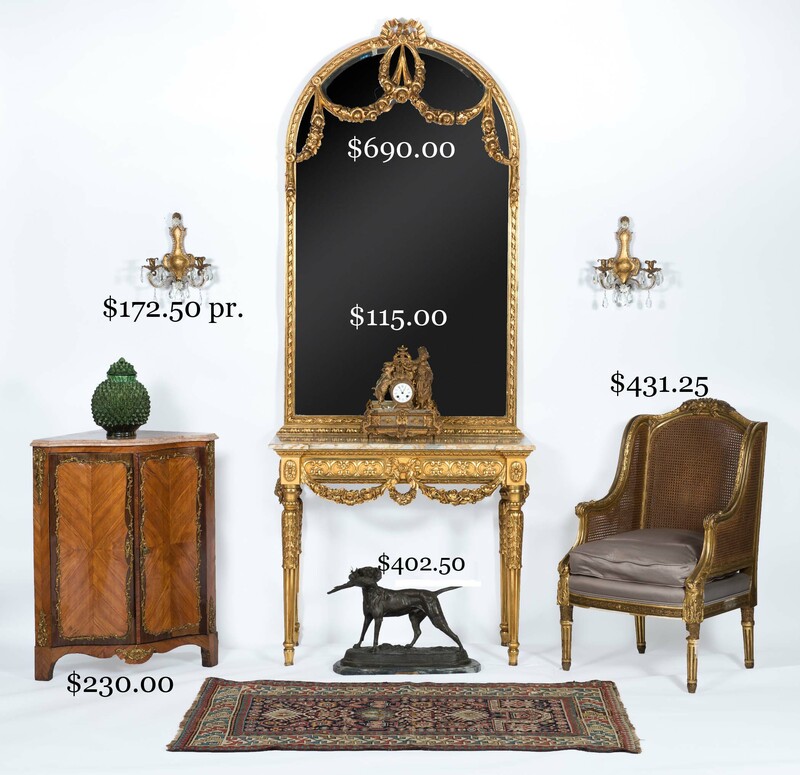 Good Chippendale, theorem reverse-painted and carved frame mirrors. 63 X 33 in. standing pine shelves in old finish. Table top pine clerk’s desk with better cubbyhole interior. 52 X 26 in. 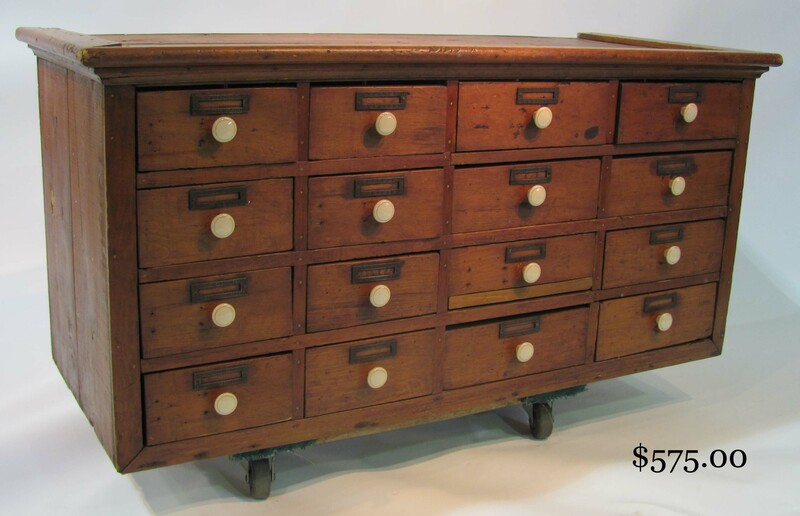 pine apothecary cabinet of sixteen drawers, originally from the Concord (NH) Pharmacy. 36 in. tapered leg cherry Pembroke table. 20 X 25 X 30 in. graduated four drawer mahogany chest on bracket base. Two drawer mahogany stand on reeded legs below ringed columns. Other good stands. 38 in. reeded leg mahogany Pembroke table. 42 in. 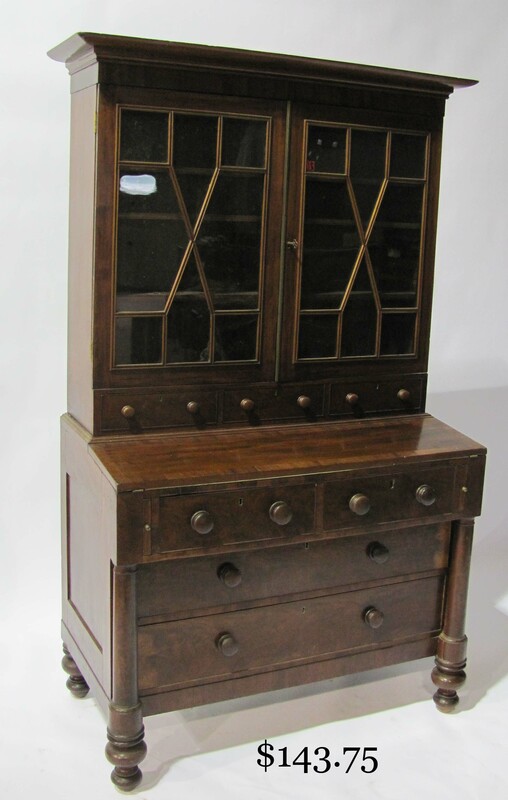 glazed top mahogany secretary desk on bulbous turned legs. Nest of three Continental stretcher-based oak occasional tables. Pair of fine 19th c. maple and pine twin beds with deep-carved pineapple and acanthus posts. 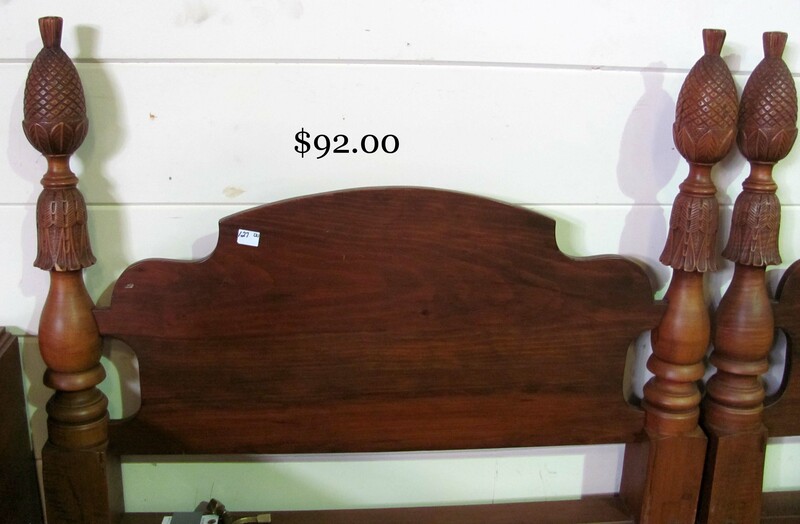 Full-size curly maple 19th c. bed with acorn posts. 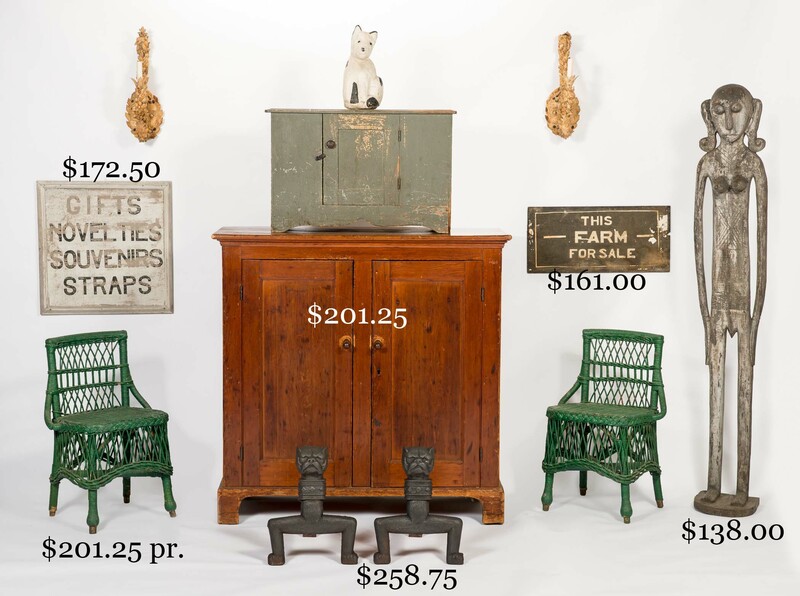 LATE 19TH AND EARLY 20TH C. FURNITURE: 103 in. 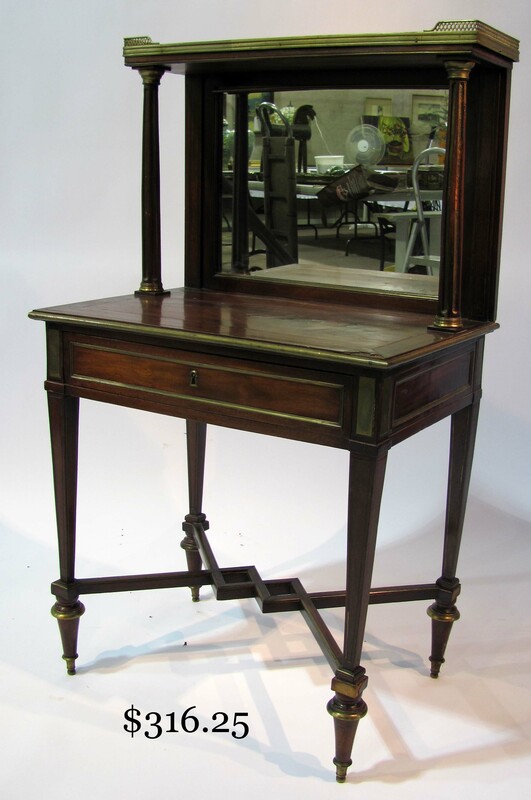 extensively carved and gilded marble top pier table with mirror. Carved and gilded fancy armchair with caned back and upholstered seat. 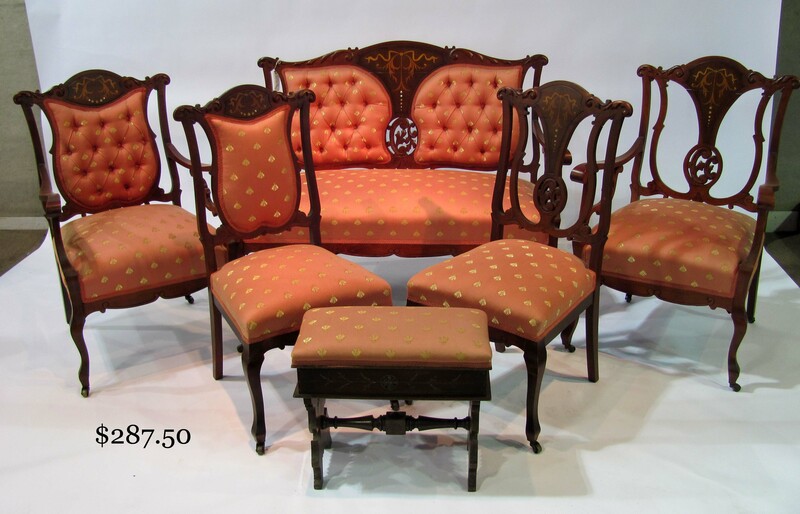 C. 1900 six piece upholstered parlor group with fancy mother of pearl and lightwood inlay. 72 in. flat arm wicker sofa and armchair. Limbert’s (No. 1168) 28 X 48 in. mission oak one drawer table. 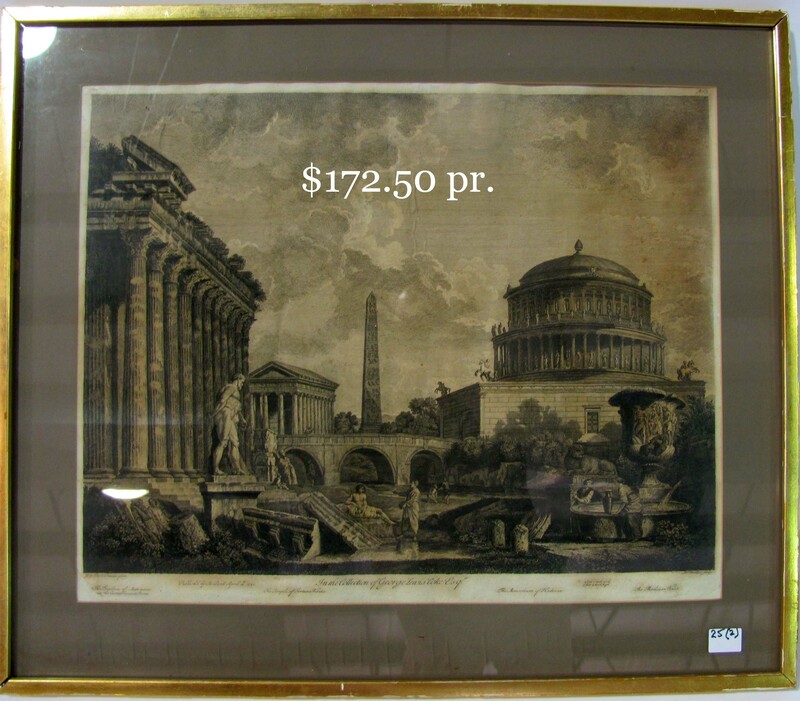 27 X 14 ½ in. Arts & Crafts storage box with incised verse and decoration. 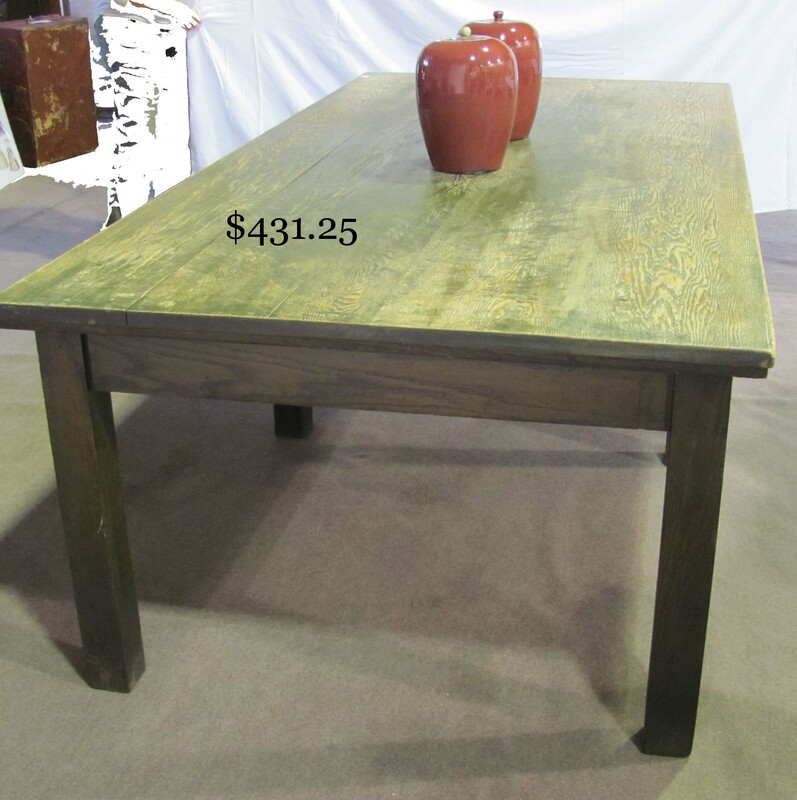 4 X 8 ft. oak conference or dining table on six square legs. 45 X 33 in. Continental oak coffer with deep-carved detail. 36 in. inlaid marble top corner cabinet with ormolu decoration. 27 X 18 in. 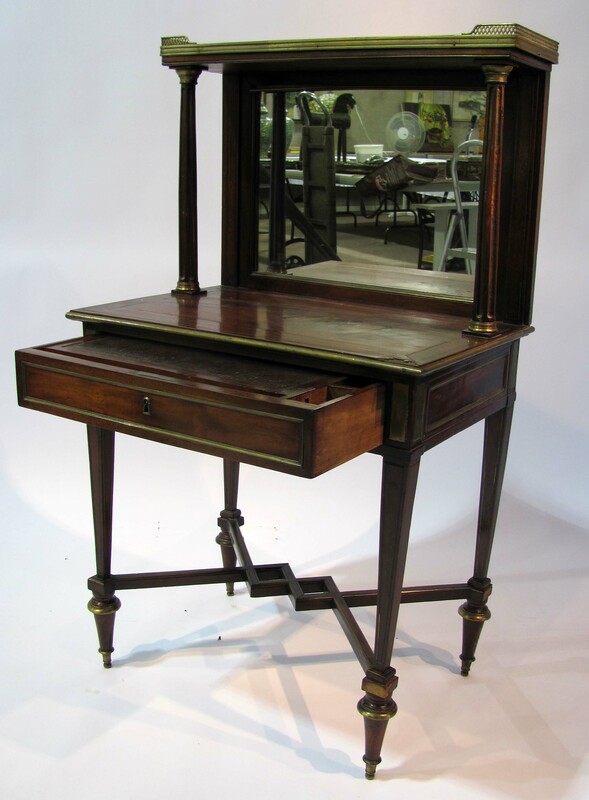 brass-trimmed rosewood dressing table with mirrored splashboard, marble top gallery and writing surface in drawer. 23 in. square French inlaid and ormolu adorned gaming table with four triangular flip out playing sections. Fancy 33 in. stick and ball design fern or light stand. Three 83 in. matching six section mahogany barrister bookcases. 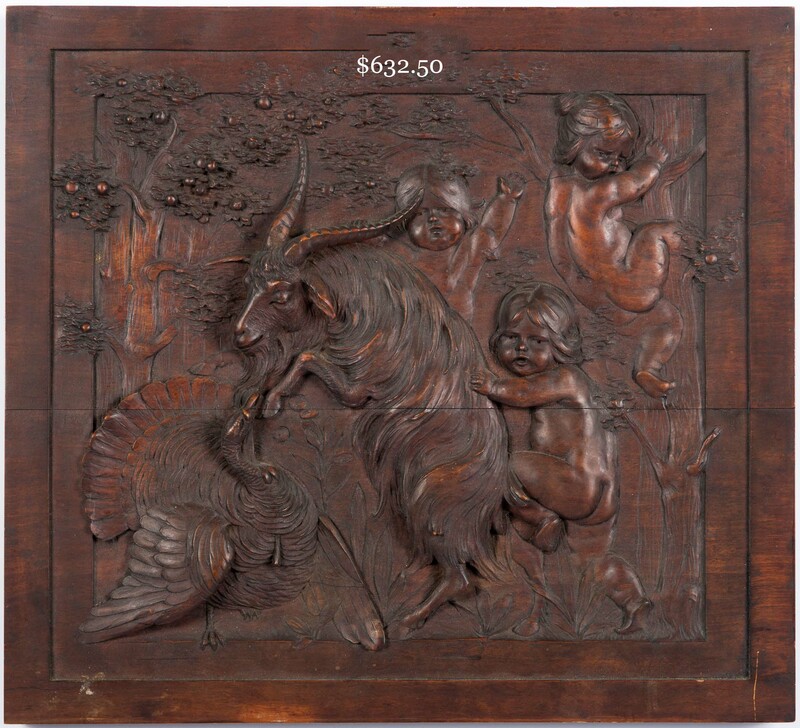 Second period tipping mahogany piecrust table with extensively carved base and top. 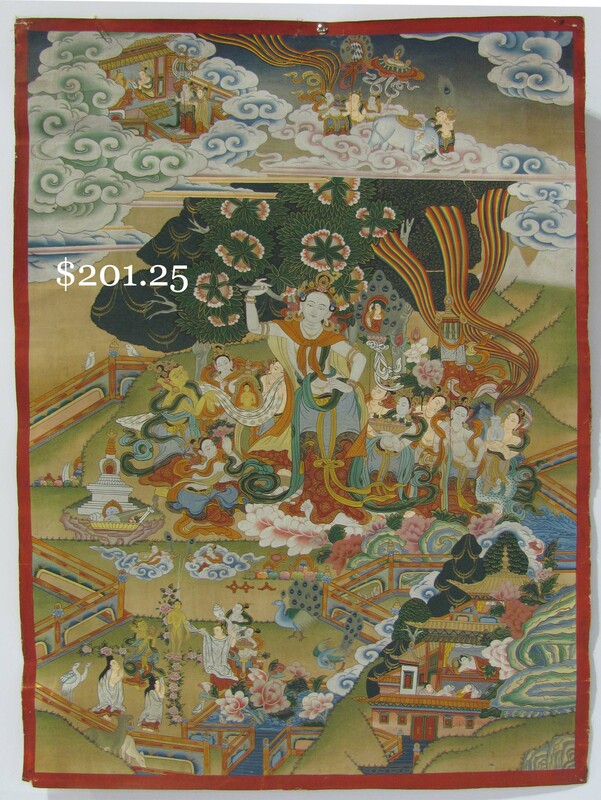 20th c. Asian four section folding screen with hardstone genre, architectural and floral detail. 19th c. red leather storage box with applied giltwood decoration. C. 1910 77 in. 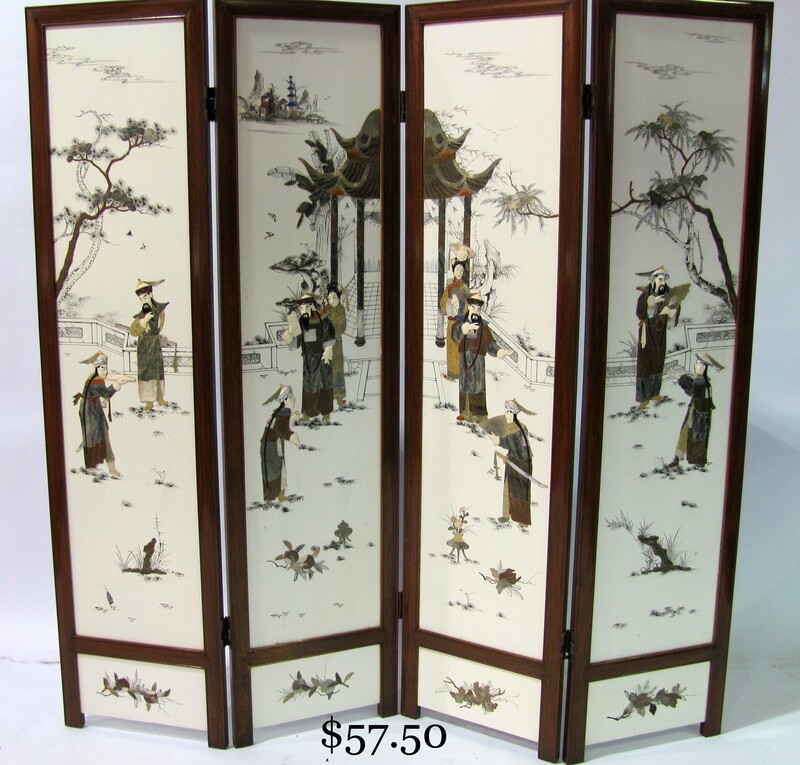 three section folding screen with shaped top and decorative panels. 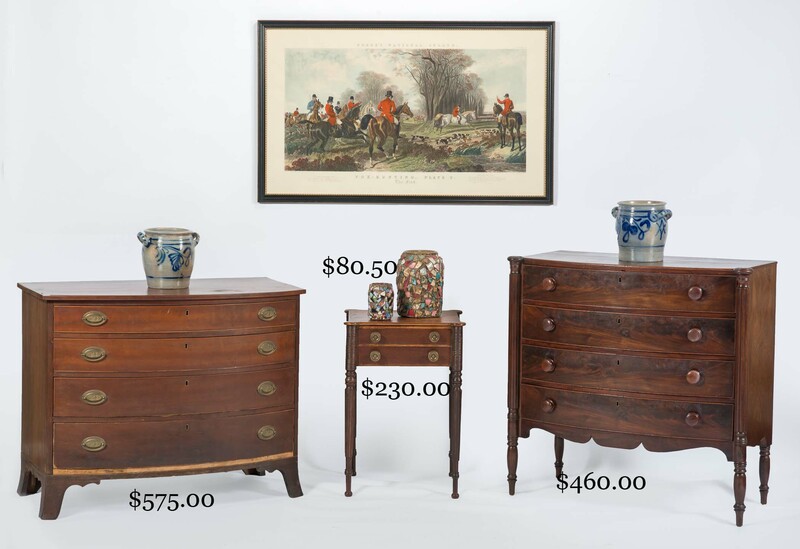 Multi-period occasional furniture. SHAKER ITEMS: 5 ¾ in. diam. old green berry bucket. Covered firkins. Lined 7 ¾ in. round sewing box. Butter worker. Rug beater. Tin lamp filler. 24 X 14 in. confetti hooked mat. 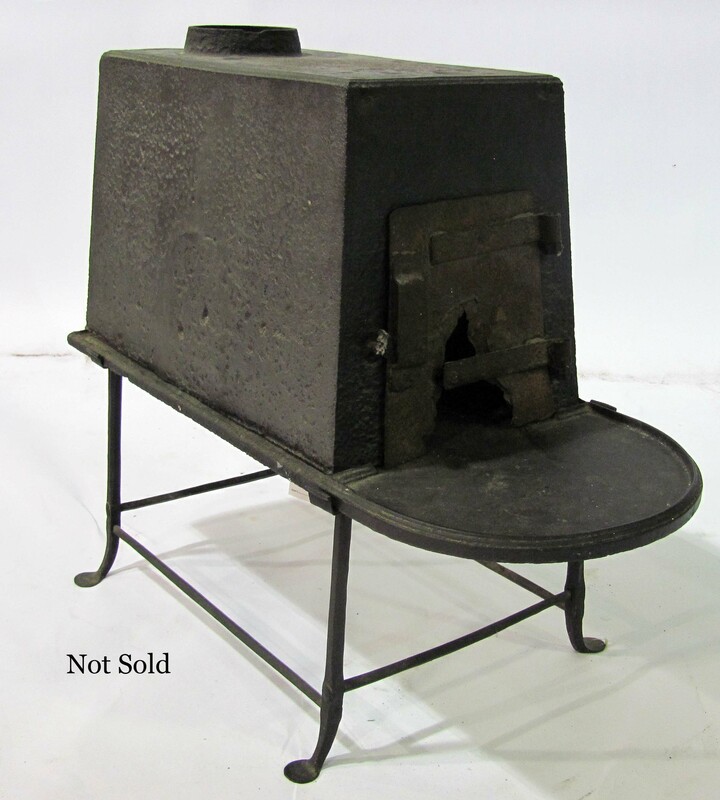 Cast iron Shaker stove. Good selection of Shaker ephemera. OLD TOYS, GAMES AND DOLLS, MANY FROM ONE OLD COLLECTION: 20 in. George Brown “American Toys and Fancy Goods” horse-drawn tin express wagon. 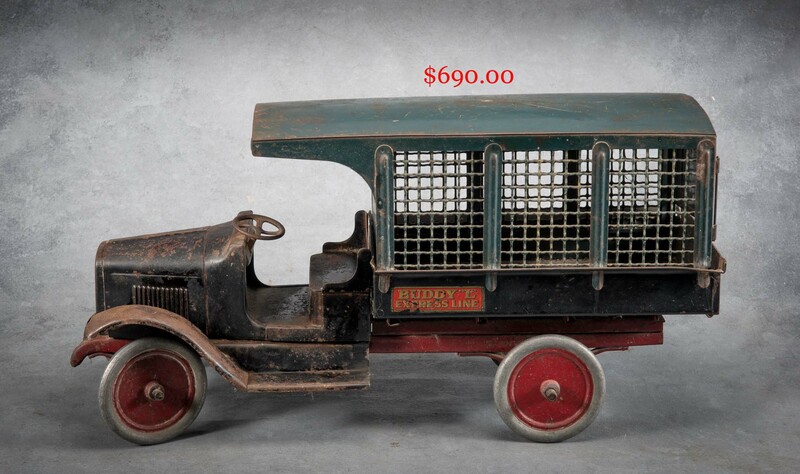 Buddy “L” Model T and Express Line delivery truck. Tin (Marklin?) man-pulled delivery cart. 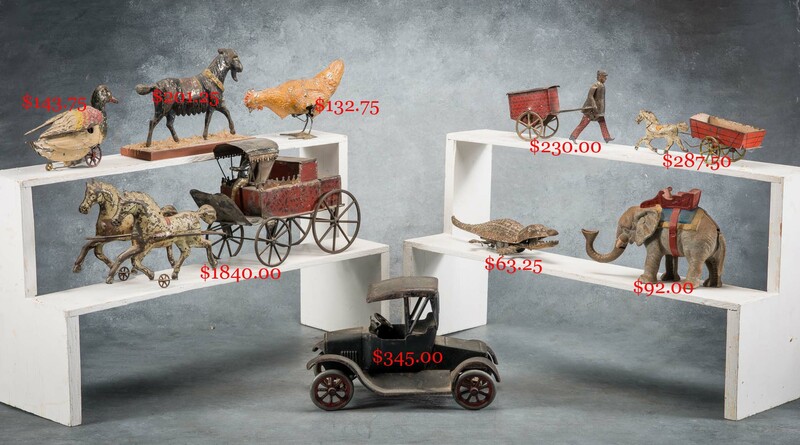 Horse-drawn tin dump cart. Chicken, goose and alligator tin windups. Standing tin goat. 8 in. cast iron elephant mechanical bank. Old wood and tin locomotive. Old Lionel “O” guage train and accessories. Collection of older 20th c. toy fire vehicles. Black fiddler boxed sand toy. Historiscope. Ives bear in orig. box. 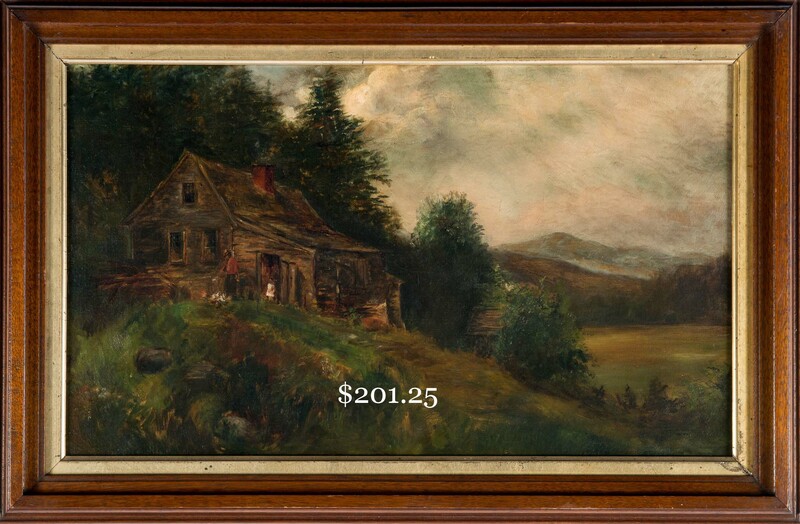 Aunt Louisa’s Alphabet of Country Scenes Cube Puzzle and Child’s Delight picture book. Gilt Edge Building Blocks and Cube Puzzle. McLoughlin Fire Engine picture puzzle, complete with box. McLoughlin Locomotive and Advance and Retreat boxes. Bradley’s Boy Scout Ten Pins, Scout Seneca 2A camera and 1912 Scout Plays and Pastimes. Smoke Showing board game (1984). Halloween and Easter toys and ornaments. Good selection of older children’s books. 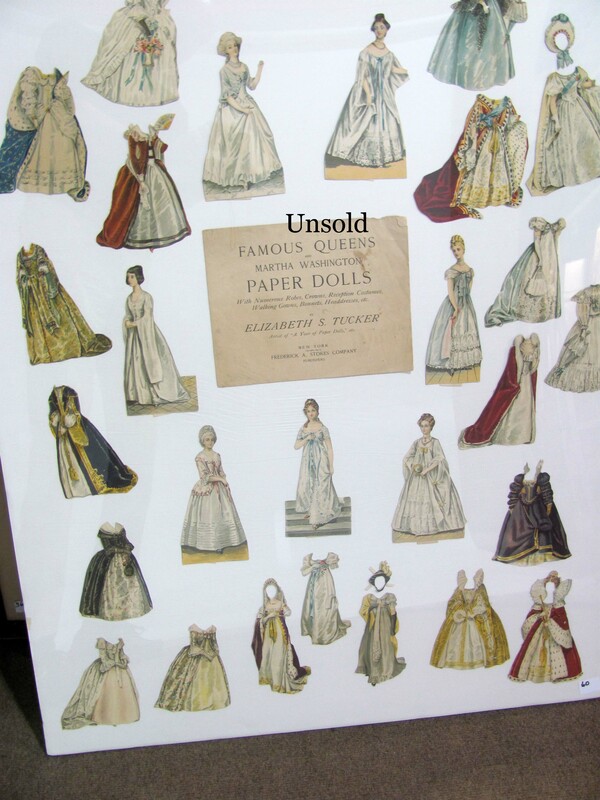 E. S. Tucker Famous Queens and Martha Washington Paper Dolls. 13 in. Armand Marseilles doll. Collection of 19 older 20th c. Steiff animals. 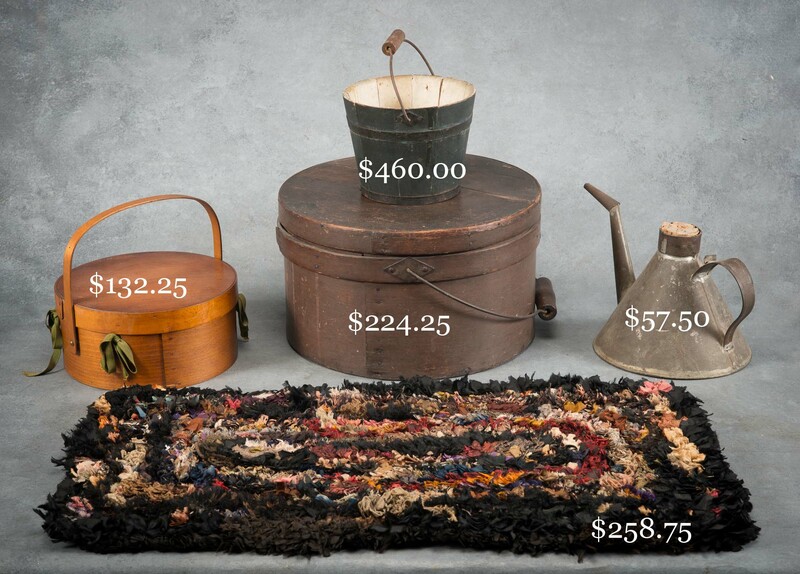 Old doll beds and accessories. 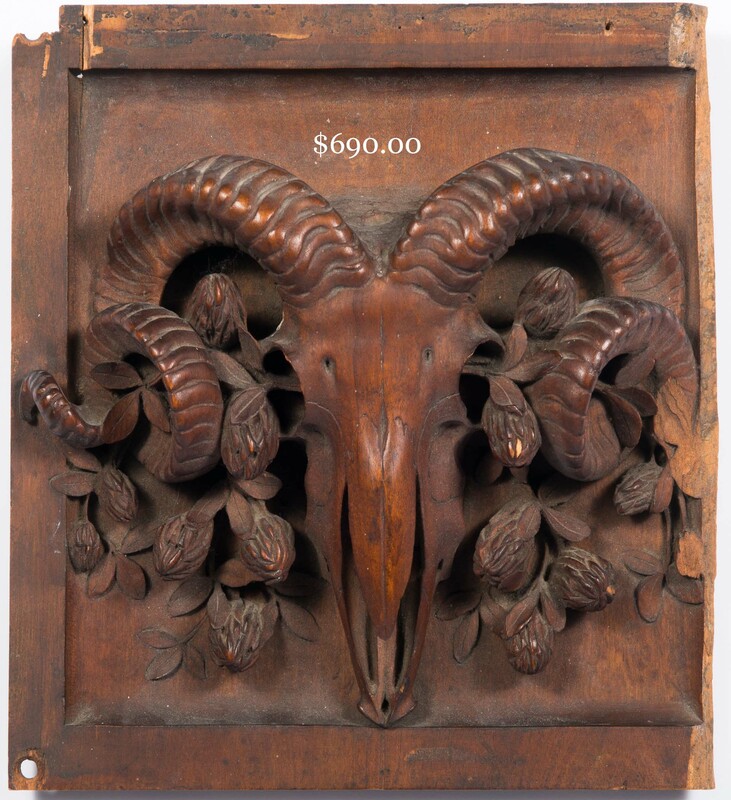 FOLK ART AND CARVING: Created by Italian artisans brought to Providence, RI, three 19th c. carved friezework panels removed from an East Side, Providence house at its early 20th c. demolition, the panels depicting a ram’s skull, putti at play with a ram and turkey and putti amongst swags and baskets of fruit, measuring 55 X 10 in. Selection of 18th and 19th c. needlework samplers and family records. Two Ivah W. Spinney (Portsmouth, NH) bottle-mounted ships and one with carved man with tote on shoulder and pencil in opposite hand. 23 X 16 in. 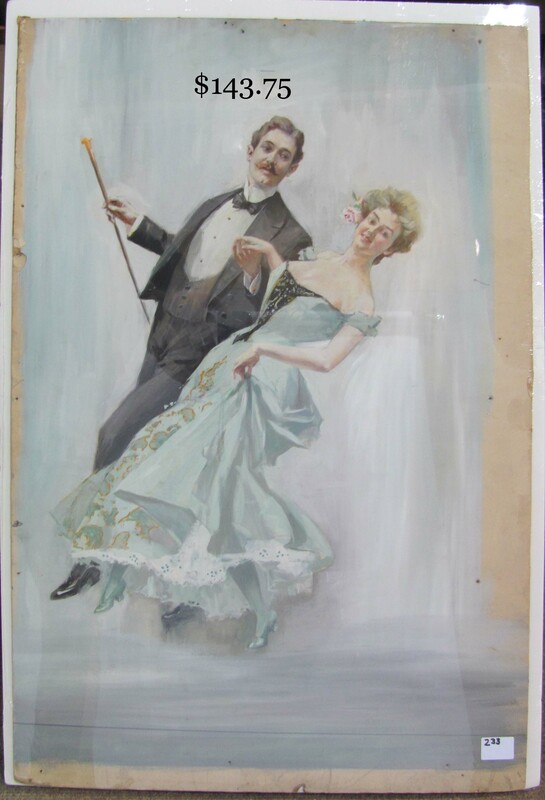 tramp art picture frame. Homemade 22 in. 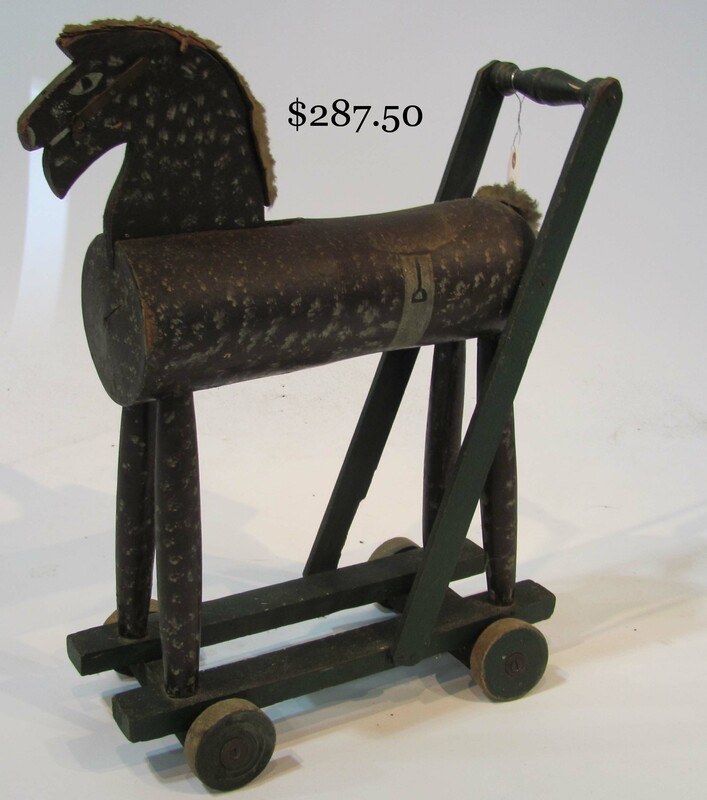 paint-decorated horse push toy. Five glass-enclosed Victorian youth and floral compositions. 47 in. feather tree. 13 in. home-carved old green turtle. 13 in. sculpted stone composition seated dog. 22 in. 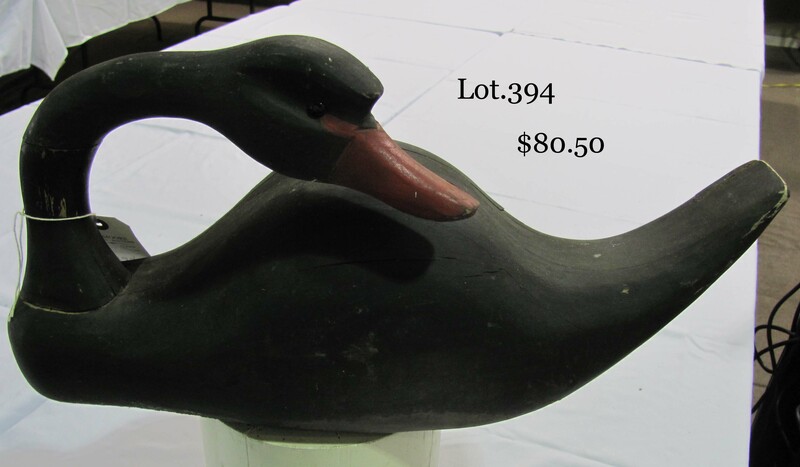 turned head goose decoy. Old seashell picture frames. 66 in. early 20th c. island-carved standing female figure. ANTIQUE TOOLS, SCIENTIFIC AND MUSICAL INSTRUMENTS: 18th c. 10 ¼ in. complex moulding plane with the mark of John Short of Newburyport, MA (1771-1819) and from the same family nine I. (John) Sleeper marked moulding planes, John Sleeper being a Newburyport contemporary of Short’s. Other early planes, three with the Sleeper wedge design. Early 19th c. wooden bit brace with wood socket chuck and thumbscrew. Lot of fine carving chisels. Two Stanley #55 multi-planes with irons and fences. Stanley #20 circular plane. C. Becker (NY) B-3550 cased jeweler’s scale. W. & L.E. 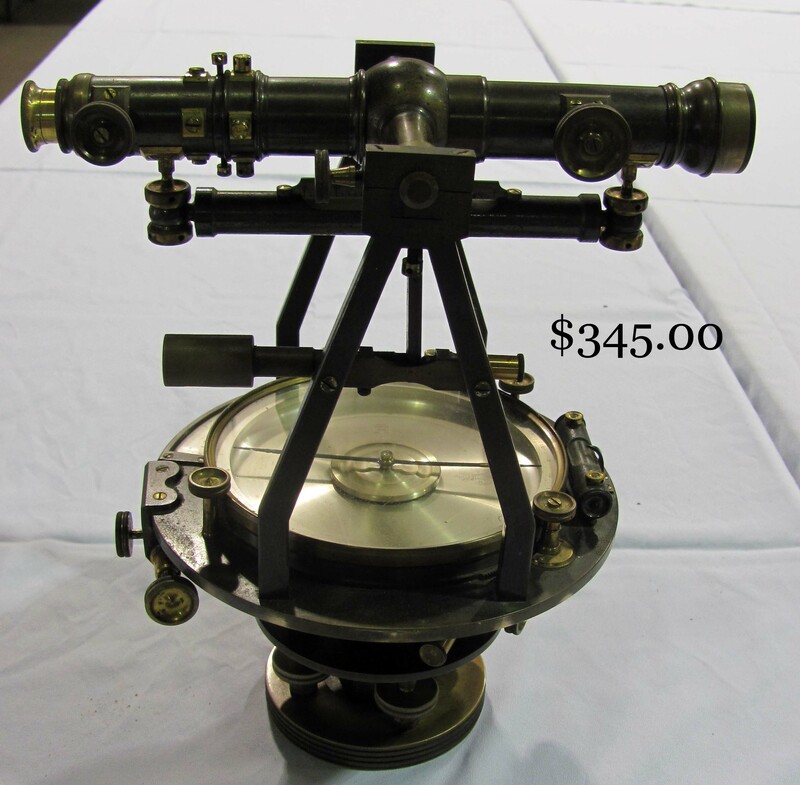 Gurley (Troy, NY) cased surveyor’s transit and tripod. L.F. Morrill cased violin with North Shore, MA origin. Edison Standard cylinder phonograph and rolls. OLD LIGHTING: Unmarked Arts & Crafts bronze table lamp with 20 in. floral mosaic shade. Pair gilt metal and crystal wall sconces. Victorian hanging fixture with floral shade. Art Nouveau metallic floor lamp with female figural base. Girandole and other fancy table candlesticks. OLD CLOCKS: S. Willard’s Patent banjo clock. Bigelow, Kennard brass bracket clock. Two Waterbury brass ship’s clocks, one with Roman numeral dial. Figural French shelf clock. Seth Thomas wall clock on figure eight wooden mount. B.A. Europ. wall clock with carved detail. GUNS, MILITARY AND FRATERNAL: Marlin 38/55 rifle in working condition with good finish. Early wall hanger musket. Harvey B. Getchell’s induction, discharge and G.A.R. paper and sword. His bayonet and shot flasks. 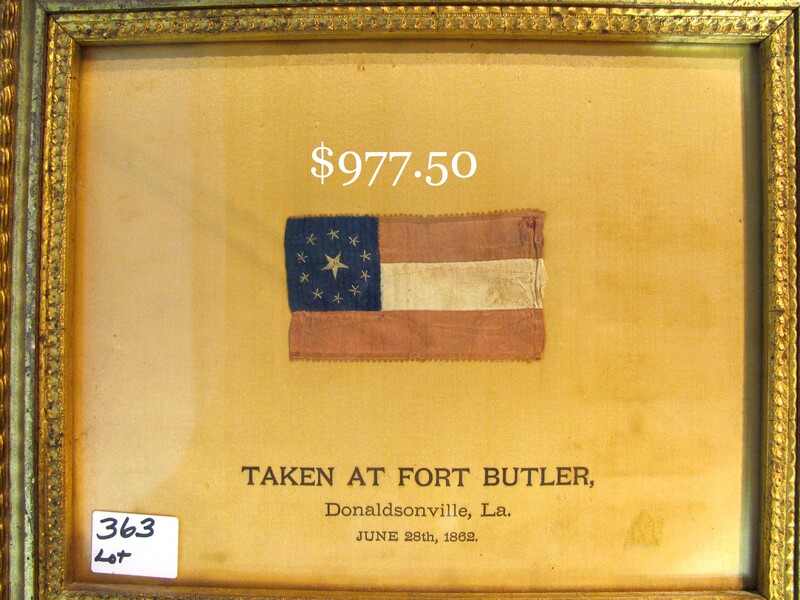 2 X 3 1/2 in flag with ten stars encircling one large star, the flag sewn on fabric mount having the inscription, Taken at Fort Butler, Donaldsonville, La. June 28, 1862. Masonic star. 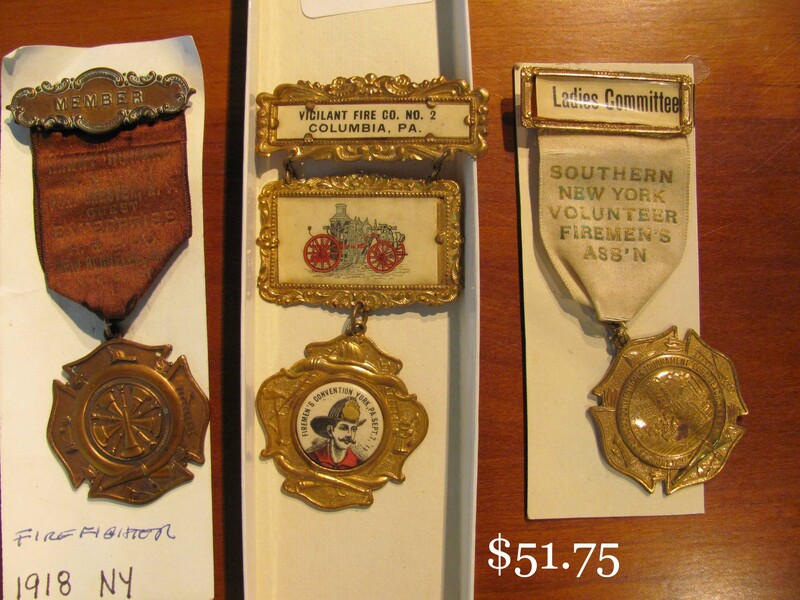 Old PA and NY Fireman’s medals. ESTATE SILVER: Good selection of sterling flatware, candelabra, serving pieces, decorative tableware and accessories. Decorative silver-plated ware. ESTATE JEWELRY: Good selection of gold, sterling, platinum, diamond and other gemstone jewelry. Stylish old costume jewelry. Good single owner collection of Victorian hair jewelry. ESTATE CHINA, GLASSWARE AND POTTERY: 10 in. Rose Medallion bowl. Sevres 1846 10 in. bowl and gravy boat. Asian vases. Pair bulbous 12 in. covered red Asian jars. Late 19th c. Dairy Outfit Co. blue and white transfer “Pure Milk” store dispenser. 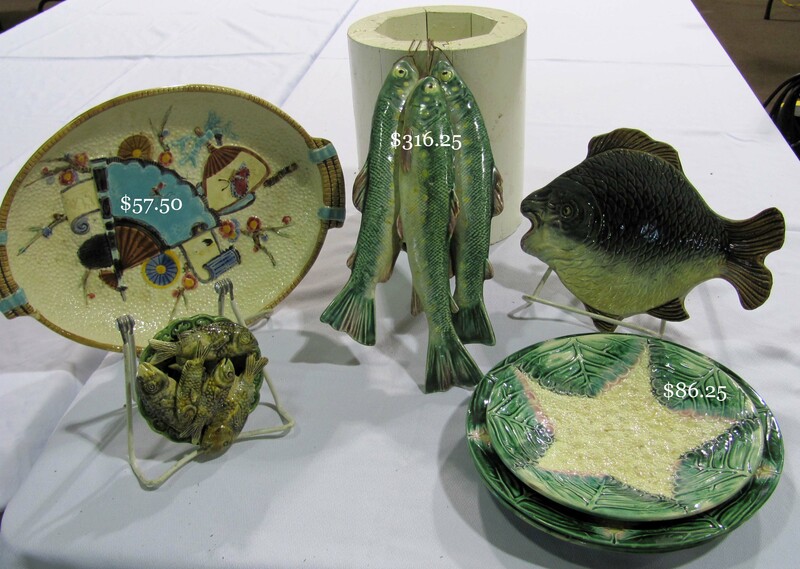 Good assortment of better style Majolica serving and decorative pieces, including rare stringer of three caught fish and fish-adorned nappie. Spanish faience. Mettlach #2083 boar hunt tankard. Royal Doulton Dickens Ware plates. Royal Doulton and Copenhagen figures. Large collection of Boehm birds. animals and flowers. 9 in. Rosenthal dog with goose in mouth. Selection of patterned white ironstone serving pieces. Keen and Stoddard flasks. 19th c. colognes. Pair fine 9 in. footed crystal compotes. 8 in. standing Steuben goose. Coalport floral centerpieces. Belleek, Nippon and Bonn. 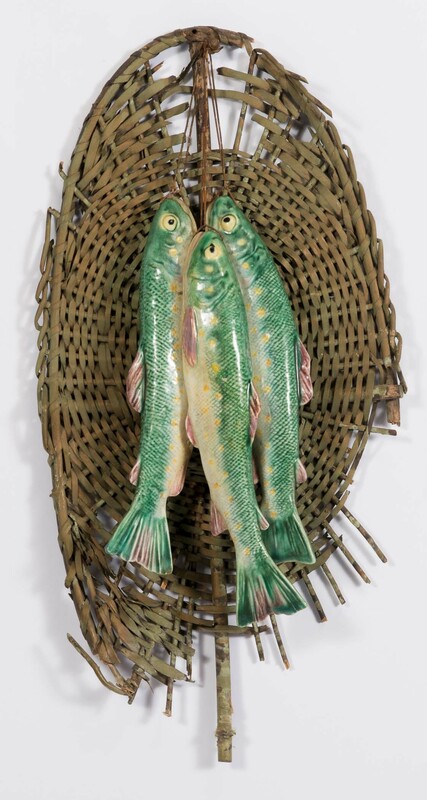 Set four Venetian glass fish-form cordials. Amethyst Christmas lights. Good decorated stoneware. PA decorated stoneware. Swasey and Trattner crocks. Early redware jugs, jars and food molds. Misc. art pottery. Memory pottery. 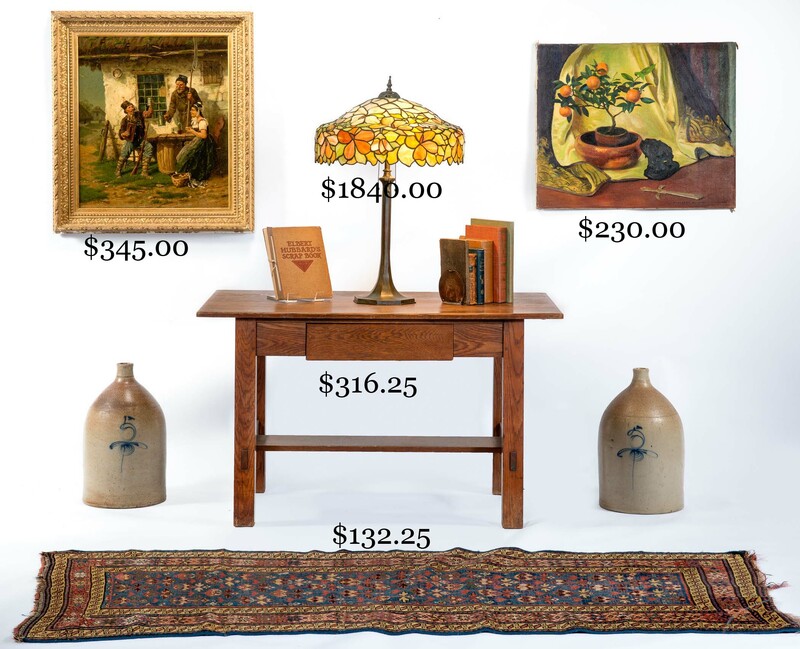 OLD RUGS AND TEXTILES: Selection of large and small area oriental rugs. Graphic quilts and coverlets. Old linens and lace. 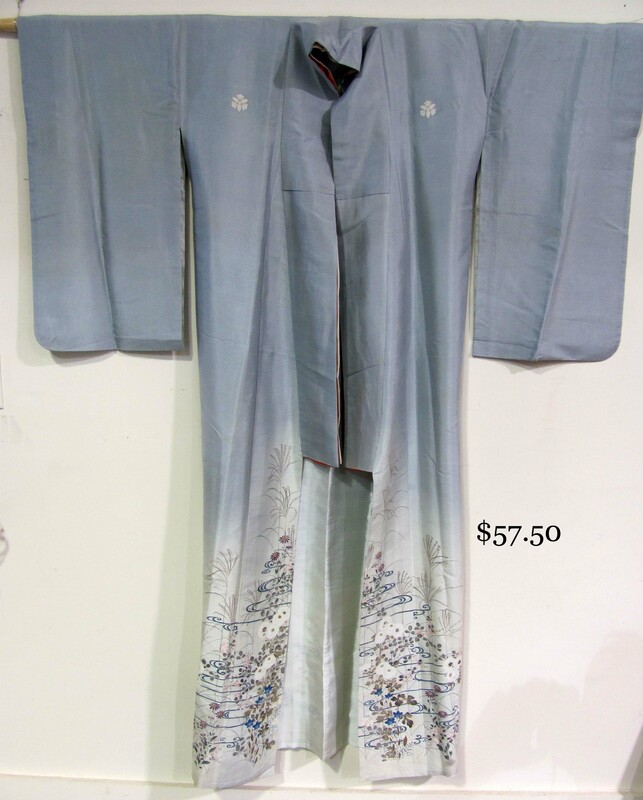 Embroidered Japanese wedding kimono and colorful obi. 102 X 36 in. 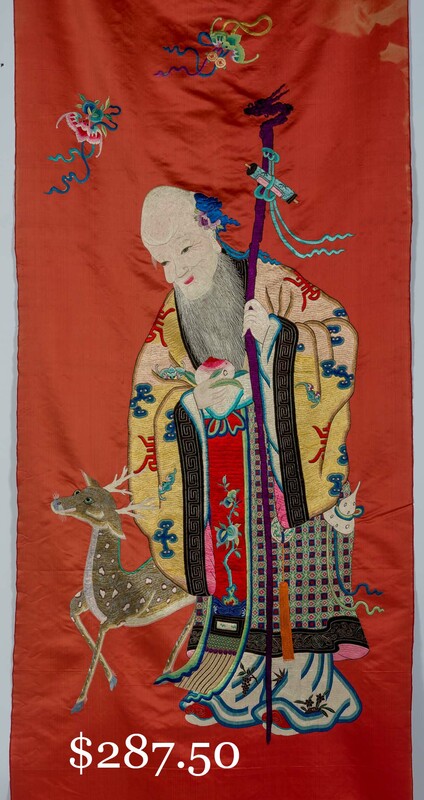 Chinese embroidered silk hanging depicting Shou Hsig, the God of Longevity. 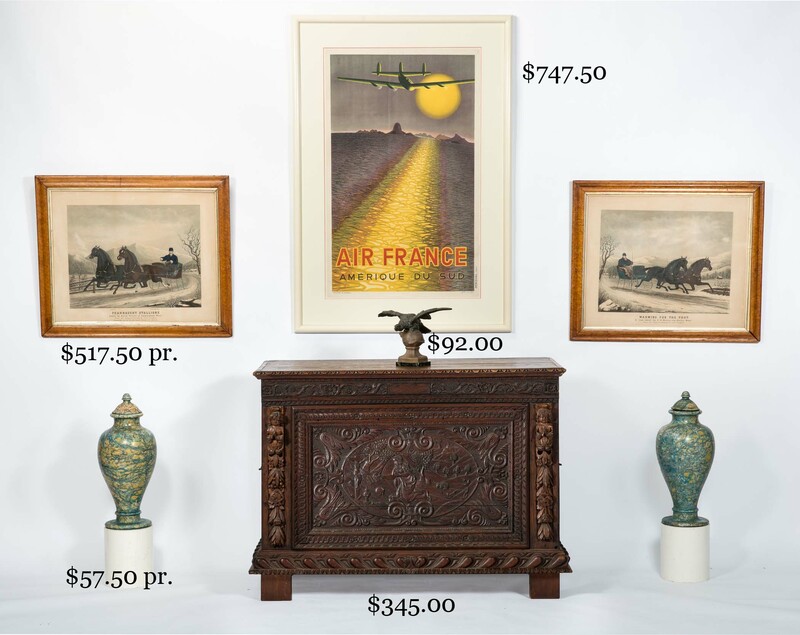 PERIOD AND DECORATIVE ACCESSORIES: Old baskets, woodenware, treenware and selection of good butter prints. Boxes in paint. Early domestic metalware, including ram’s horn peel and brass and wrought iron kitchen implements. Early cast brass hot water kettle. 18 in. diam. copper kettle on wrought iron stand. Cast 19th c. bulldog andirons. Cast iron frog doorstop. Cloisonne and champlevé vases. Decorated coal pan. Good desk items, including fancy brass double inkstand. 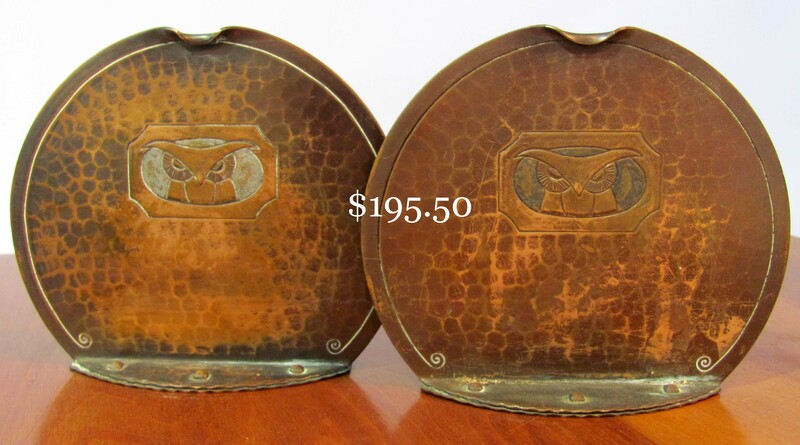 Roycroft bookends. Ladies’ old fans and good variety of ladies’ accessories. Early and unusual sewing items. Early eyeglasses. Decorated toleware. Stone fruit. Pair 20 in. sponge-decorated alabaster covered jars. Johnnie Walker advertising figure. Colorfully painted old watering cans. Old fishing lures. Large single owner collection of jack knives and other edged pieces. Early plastic Crosley radio. Maine Indian snowshoes and 4 ½ in. 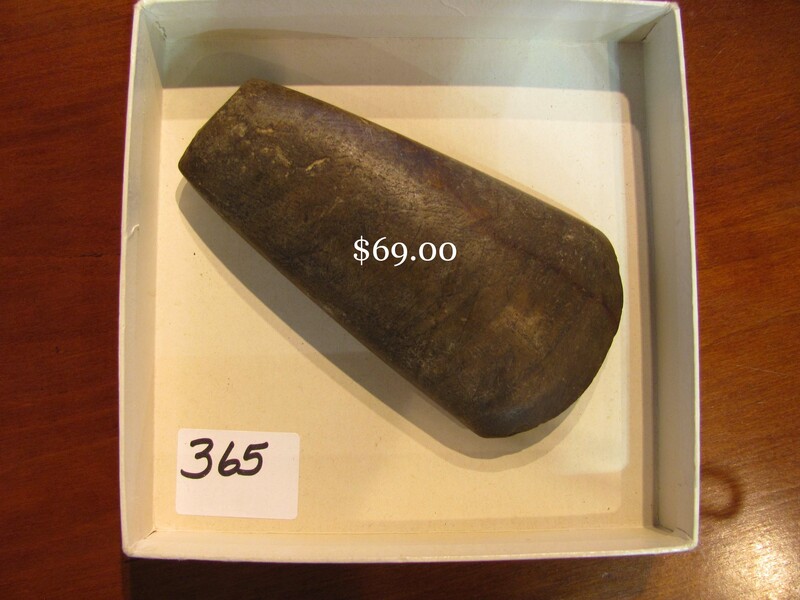 stone axe head. York Beach souvenir shop sign and another, This Farm For Sale. Several mounted racks of deer antlers. 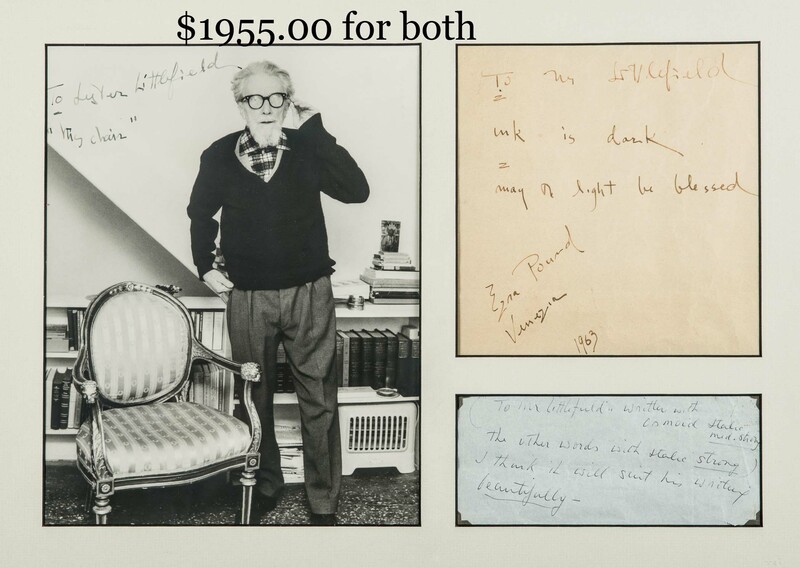 OLD PAPER, BOOKS AND PHOTOGRAPHY: Two 1963 Ezra Pound signed cordial letters to his Maine friend, Lester Littlefield (1, 2), each separately framed with inscribed 9 X 12 in. photos of Pound. 13 ½ X 30 ½ in. Engels & Webber lithograph of Camp Tilden, Winter Quarters of 16th Maine Regiment (1864). 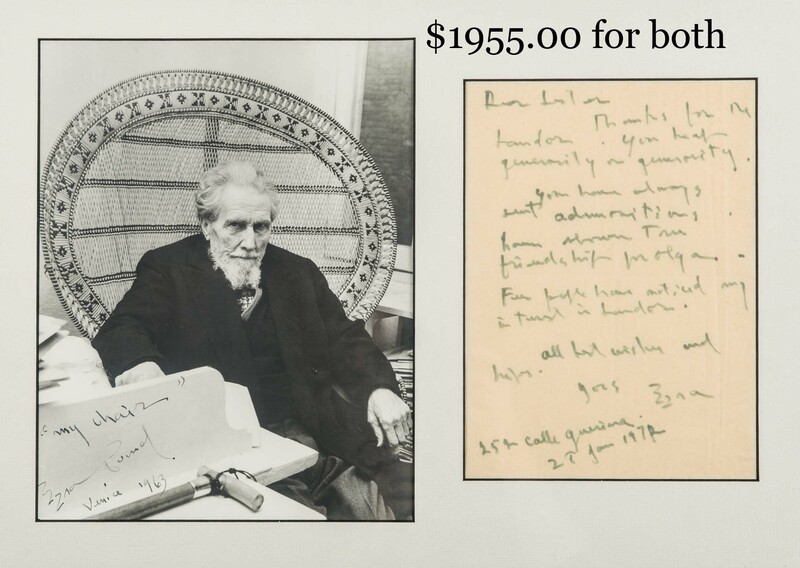 The extensive lot of 19th and early 20th c. family papers, photography and ephemera relating to the Perkins family, South Berwick, ME, to be sold as one lot. Large lot of ephemera, logs and correspondence from Boston and Cambridge, MA Fire Depts. from 1924 forward. Lot of framed showroom and other photos depicting the history of Cavanaugh Motors, Manchester, NH from the introduction of the auto. Early 20th c. family photo and travel albums. Elbert Hubbard Scrapbook. Early York, ME travel and other ephemera. 7 ¾ X 9 ¾ in. framed photo of 1932 NY Yankees, American League Champions. Two Electro Broadcasters 33 1/3 records of Gov. F.D.R. and John Garner speeches. Old advertising paper, including good tobacco and Sweet Corn examples. Books on hunting, fishing and the outdoors. Qtr. 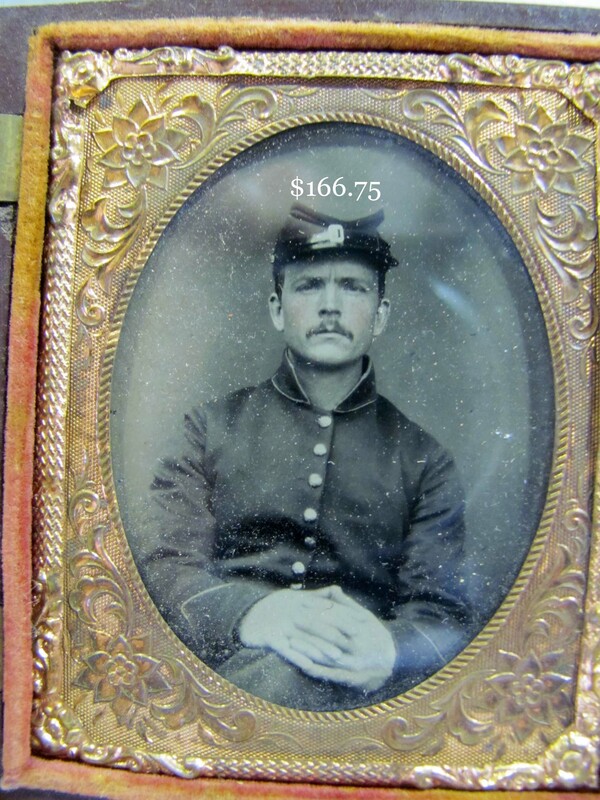 plate ambrotype of seated Civil War soldier. Lot of unusual and special interest old photos. 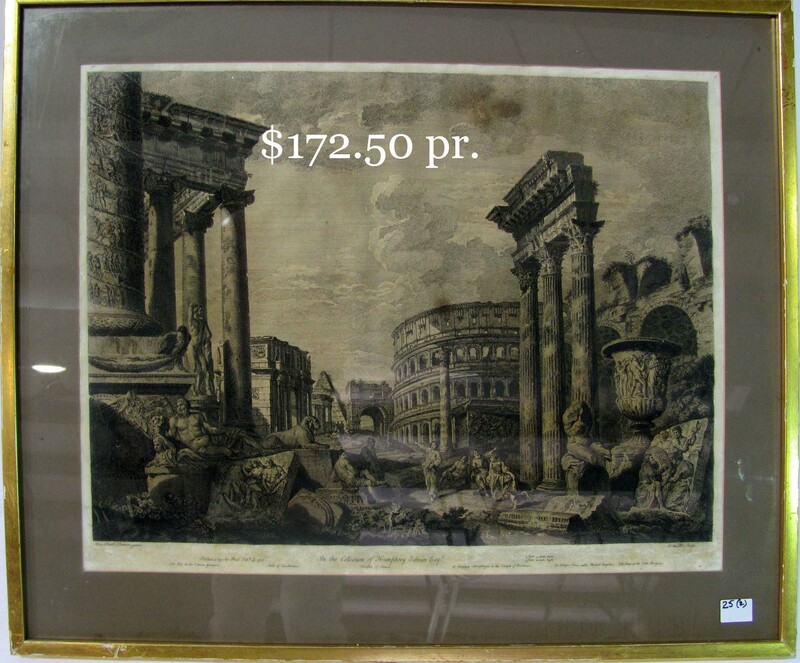 OLD PAINTINGS AND PRINTS: 7 ½ X 9 ½ in. 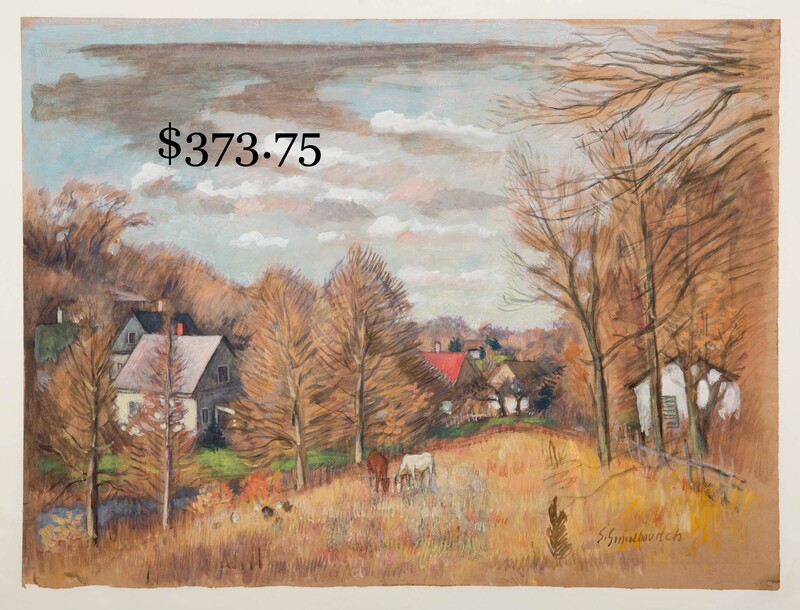 J.J. Enneking landscape o/b. 29 X 36 in. (C.H.) Woodbury o/c of Marginal Way breakers. 20 X 30 in. Thomas W. Wilson o/c, Feeding Time, Surrey. 20 X 24 in. E. Gruppe o/c, Fishing Boats at Dusk. 20 X 30 in. 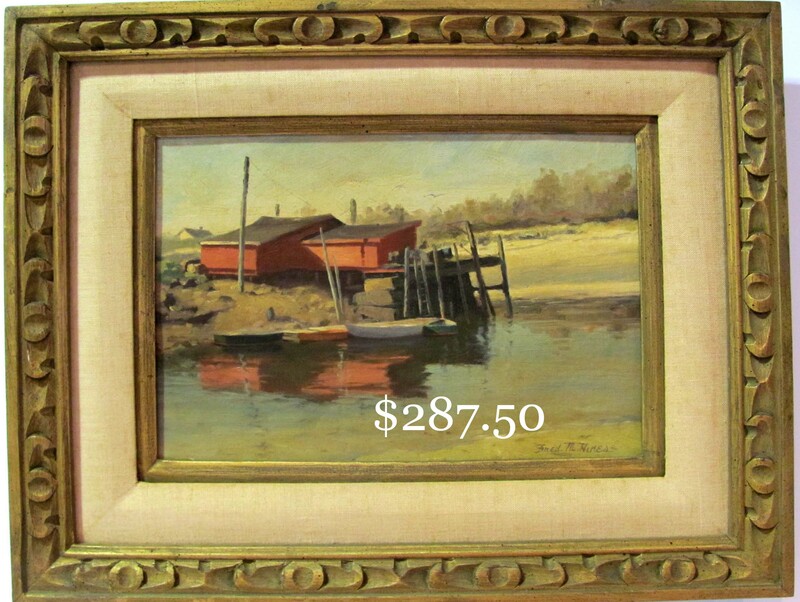 Walter L. Dean o/c or sailboats moored in an inlet. 24 X 32 in. 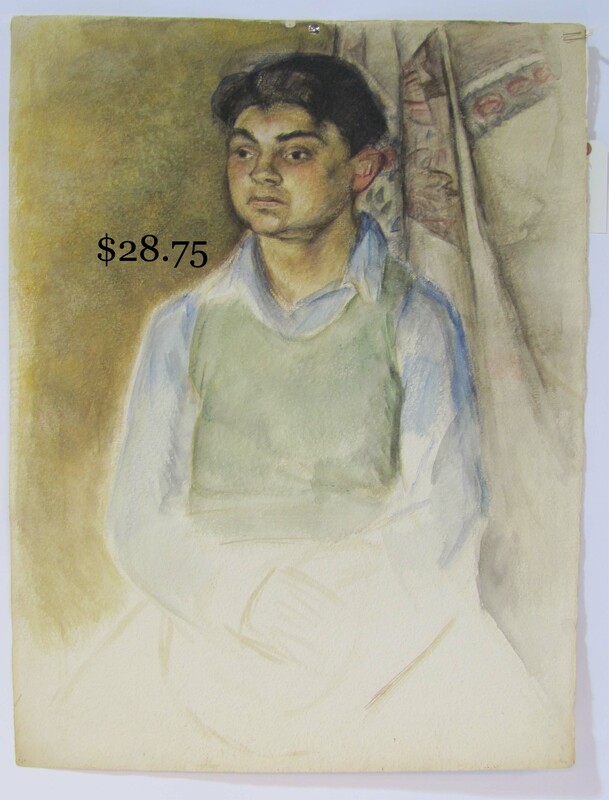 Simka Simkhovitch landscape w/c and unfinished 30 X 22 portrait of young man. 25 X 30 in. Margaret Fitzhugh Browne fruit still life o/c. Two 7 X 5 in. 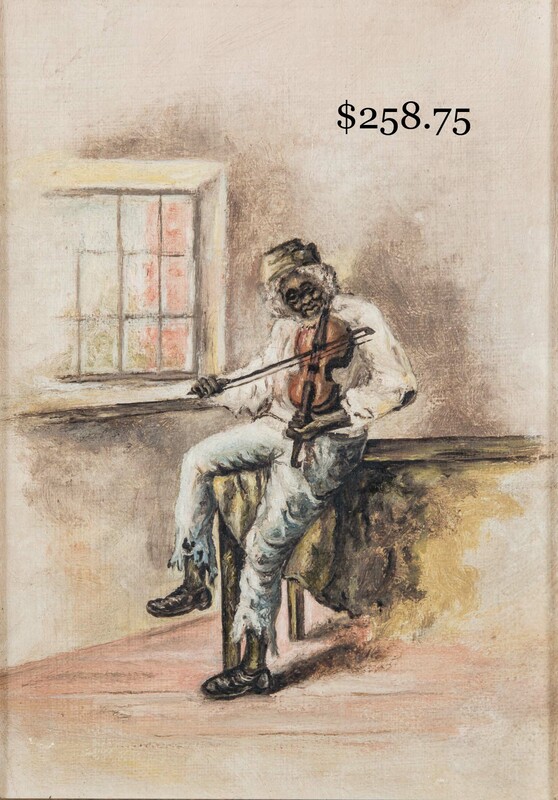 oils of southern black figures, one of seated elder and one playing fiddle. 11 ½ X 19 ½ in. o/c of black figures outside a hillside cabin. 34 X 27 in. o/c portrait of 33 X 54 in. 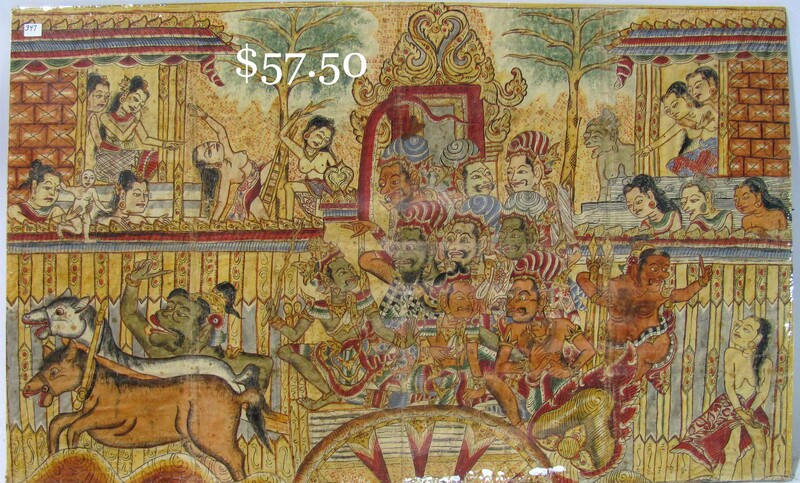 early 20th c. Balinese Ramayana depiction on fabric. 31 X 22 in. Asian Tonka. Moses Norris, U.S. 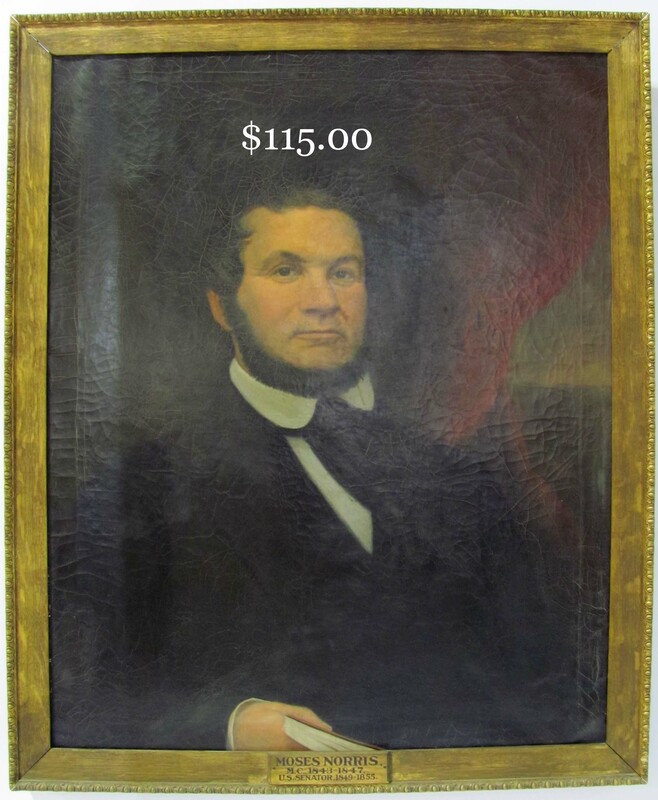 Senator, 1849-55. 9 ½ X 13 ½ in. Fred M. Hines o/c of fishing shacks. 19 ½ X 14 ½ in. George Harvey w/c of Gloucester sailboat, We’re Here. 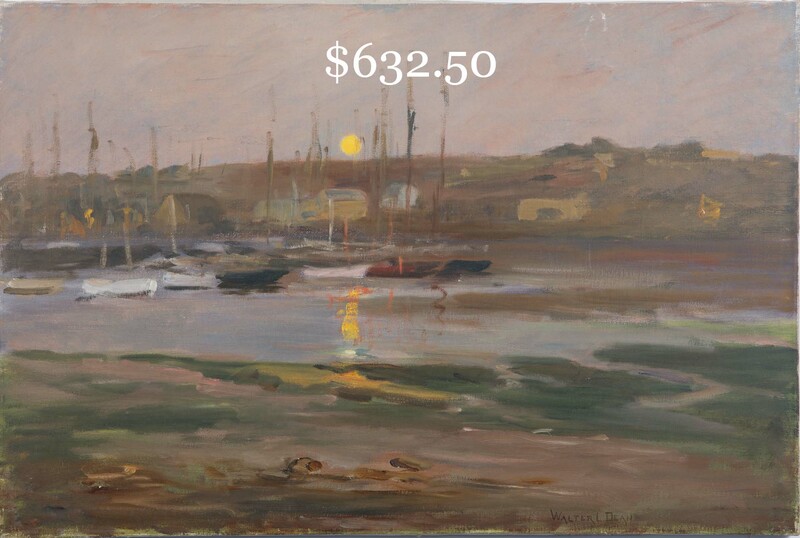 5 ½ X 7 ½ in. A.B. Wilder winter landscape pastel. 20 X 14 in. 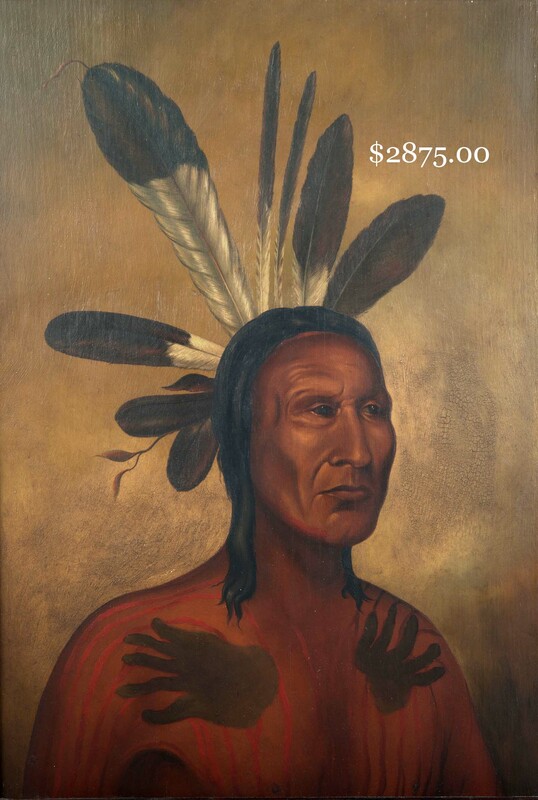 o/p of Mato Tope, Chief of the Mandan Tribe, N. Dakota. 11 X 14 in. W. Preston w/c of mallards in flight. 12 X 16 in. Charles F. L. Morton coastal cottage o/b. 26 X 23 in. 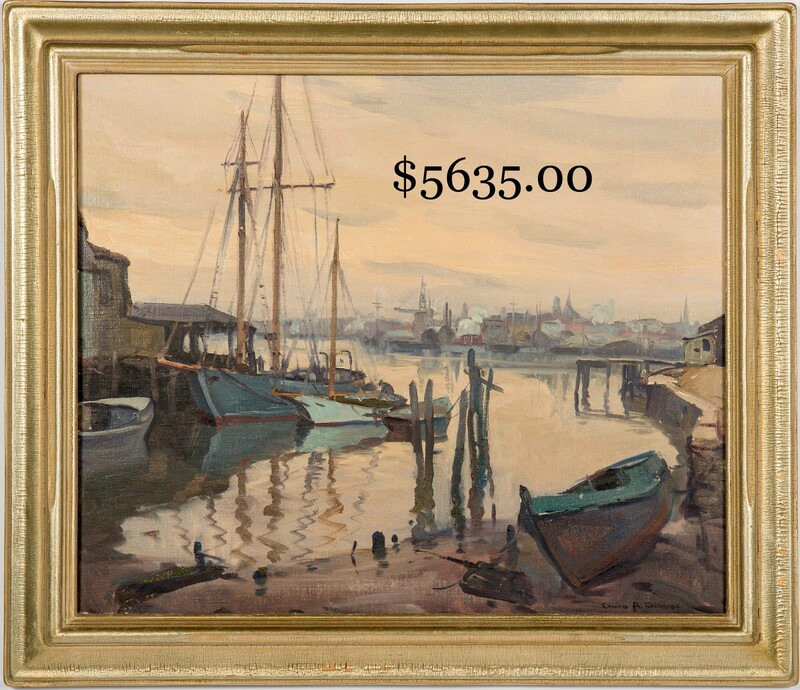 A. Butris tavern scene o/c. 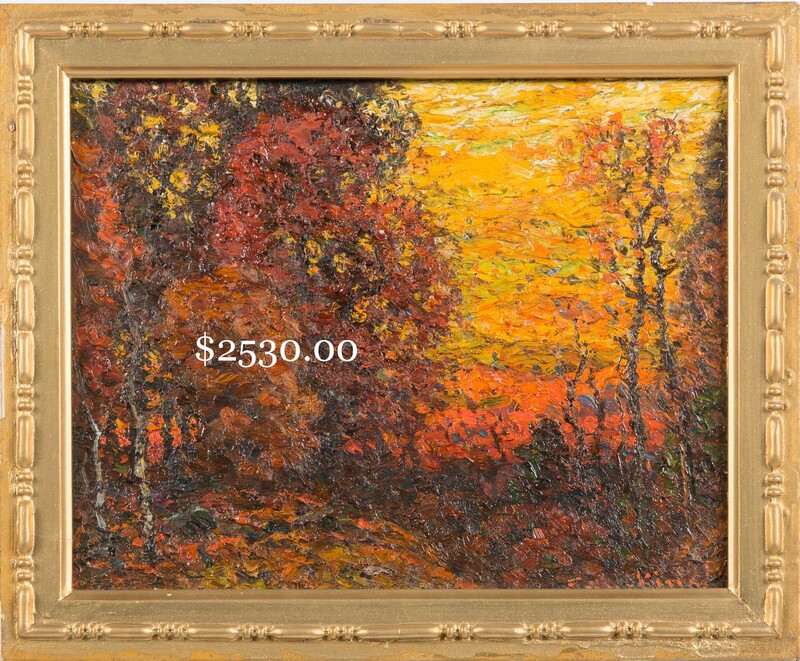 27 ½ X 18 in. w/c of dancing man and woman. 61 X 45 in. 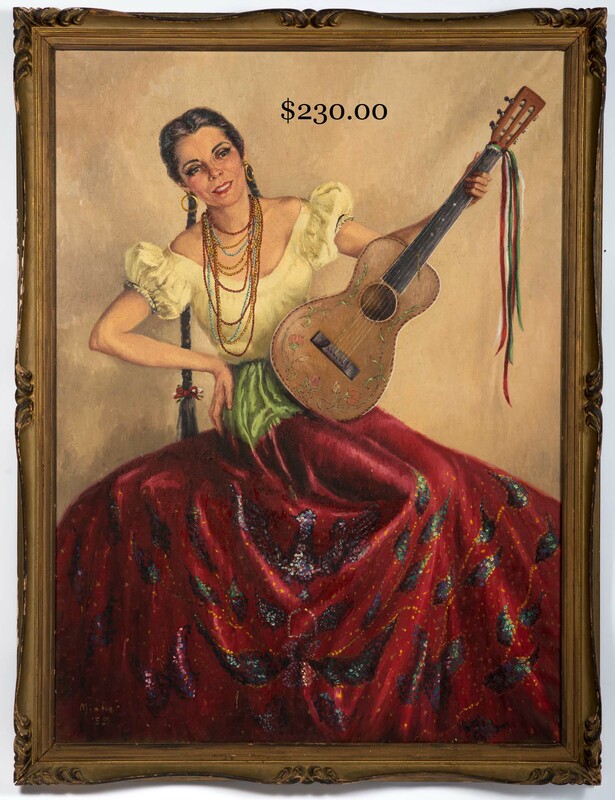 (Mary) Minifie, ’58 o/c in carved frame of female guitarist. 28 X 36 Abraham Atlas abstract and his floral still life. 17 X 23 in. Ester Atlas floral still life pastel. 26 X 21 in. Yves Brayer litho., 1887 Dusseldorf Japan Proofs, Nu a la Fenetre. Two colored prints after Scott Leighton paintings, Warming for the Trot and Fearnaught Stallions. John Laurent, ’63 etching of Henry Card. Early J. S. Muller architectural engvgs (1, 2). Victor Maunier (sp. ?) etching of Millet’s Barbizon cottage. 18 X 24 in. Fausett col. print, The Lake. 10 X 31 in. 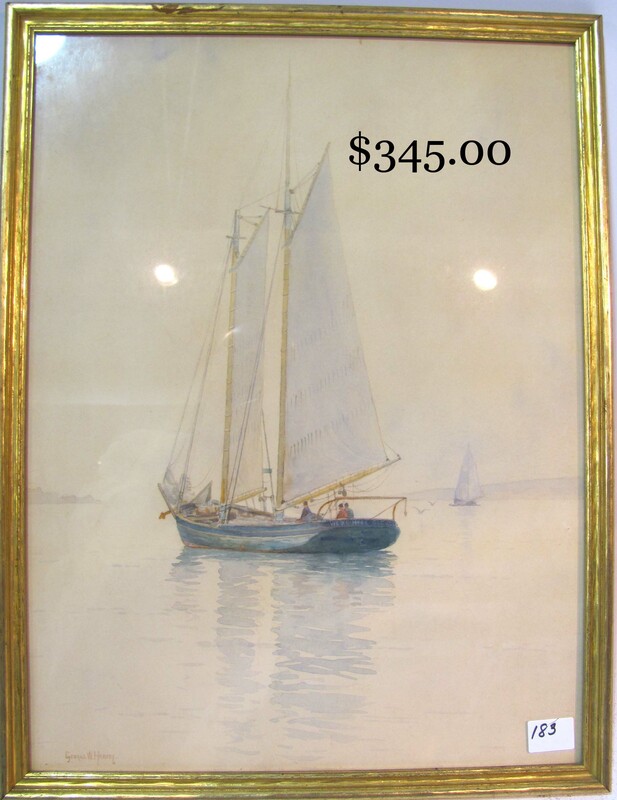 E. Montaut print of the racing boat, Chanticler. 28 X 48 in. Fores’s Fox-Hunting Plate 2, The Find. 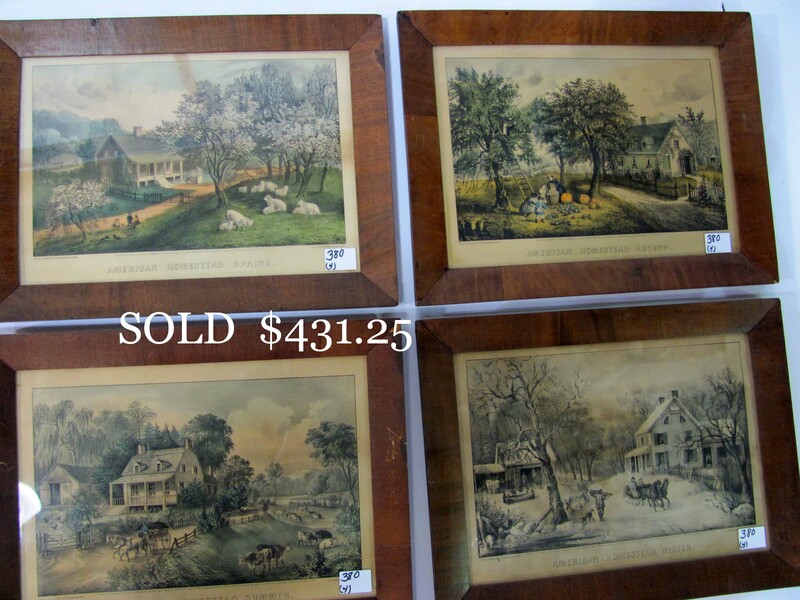 Four C. & I. American Homestead prints. Koerner fishing print. 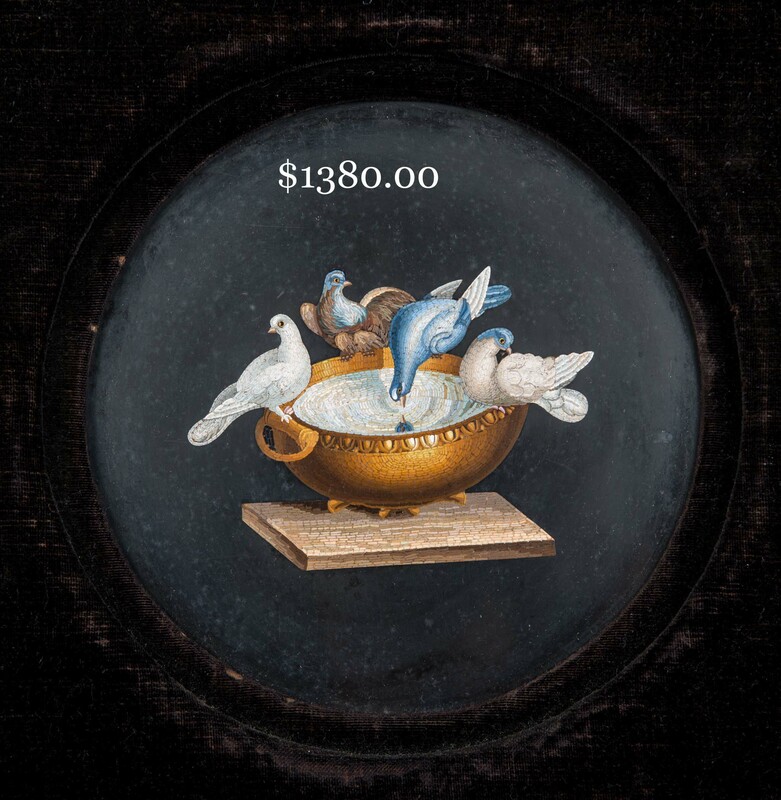 SCULPTURE: Micromosaic of four doves drinking at a bowl, set in a 6 in. 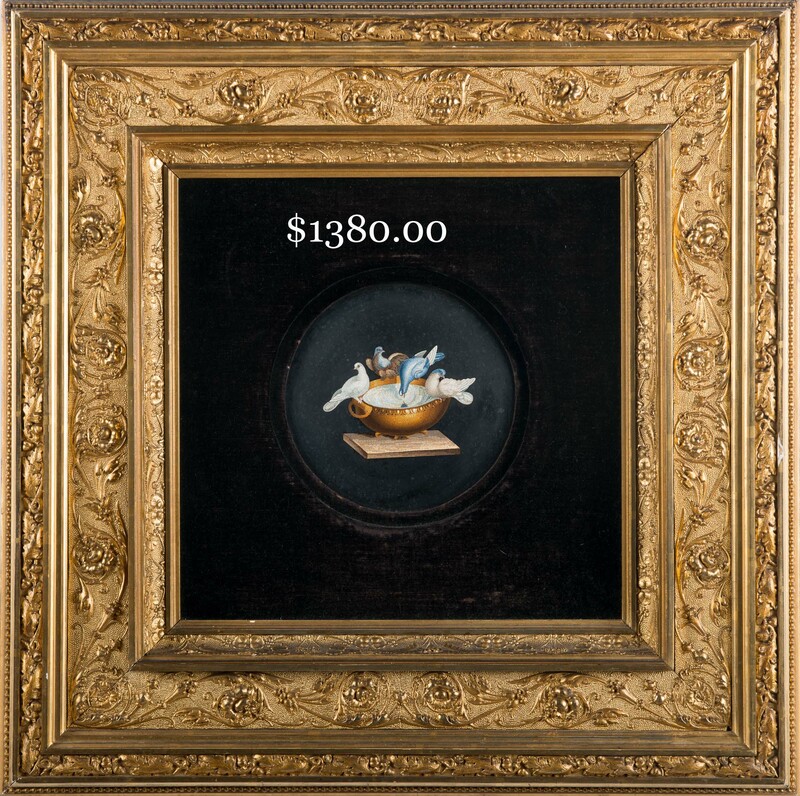 marble disc, mounted with black velvet and framed in giltwood 19th c. frame, attributed by 1968 appraisal to the 12th century. 23 in. J. Moigniez bronze, Setter With Bird. Ch. Perron 13 in. 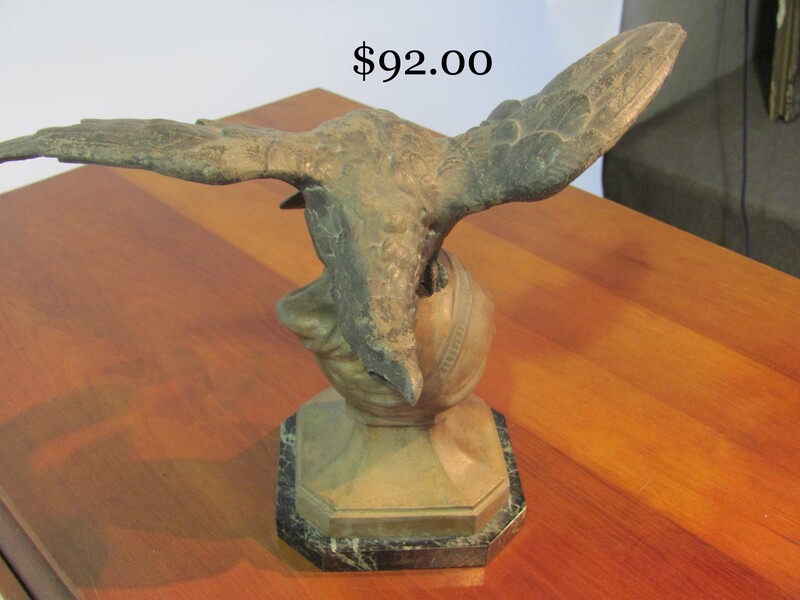 spreadwing eagle on marble mount. 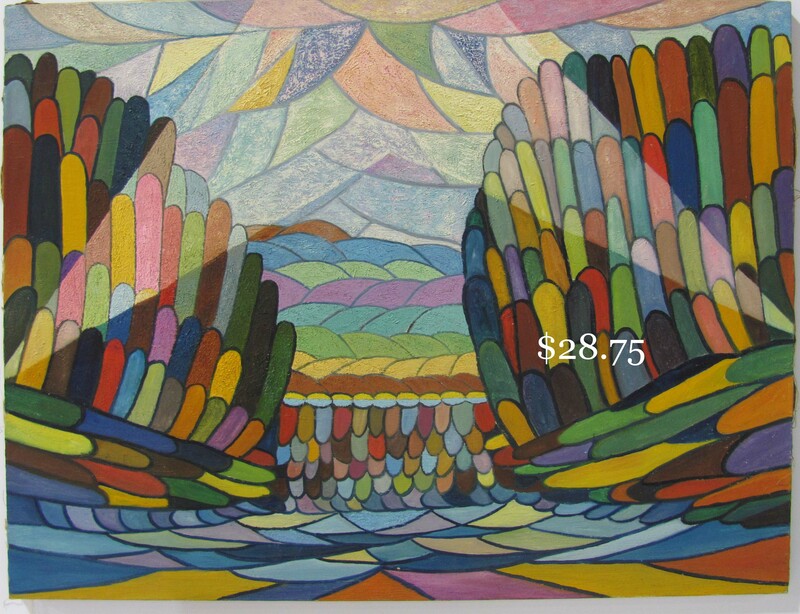 39 X 24 ½ in. Vasarely Air France poster, America du Sud.